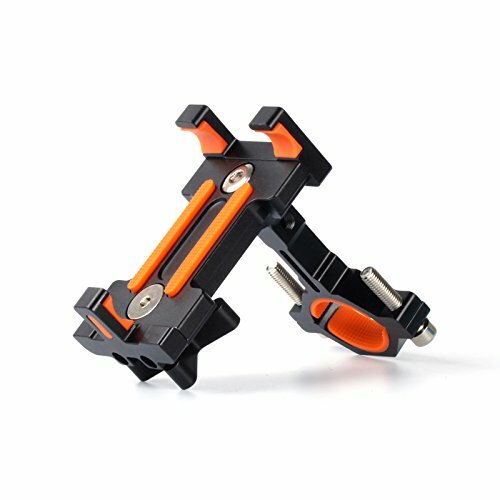 STABLE AND SECURE: Triangle shaped structure and mechanical locking can grip your smartphone firmly. Made of premium aluminum material, which is durable and sturdy than other plastic bike phone holders. ONE SIZE FITS ALL: Perfect fits any 2.4-3.7'' wide devices! Securely holds iPhone X/8 Plus/8/7 Plus/7/6S Plus/6S, Samsung Galaxy S9 Plus/S9/S8 Plus/S8/S7 Plus/S7, GPS devices and phones with similar size. FULL PHONE ACCESS: The entire phone screen, camera, buttons, microphone jack are available without remove your devices. 360° VIEWING CAPABILITY: Also supports multi-angle fixation. You can simply adjust your device orientation for optimal viewing. EASY ATTACHMENT/DETACHMENT: Comes with Allen wrench, bolts, and user manual, you can quickly install on handlebars of bicycle, motorcycle, running machine, baby stroller, shopping car or anywhere you like.